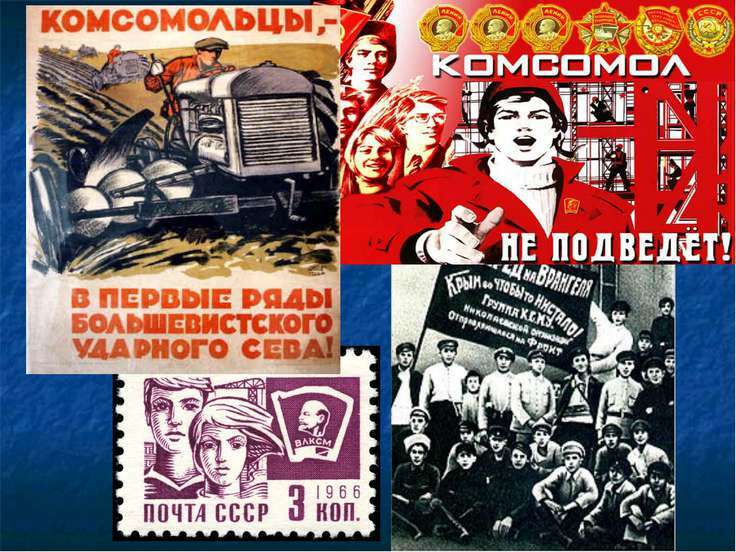 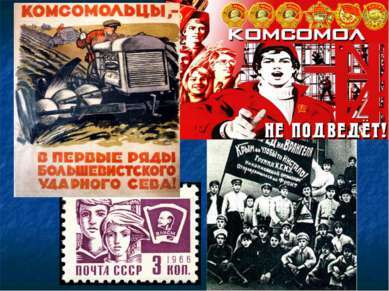 Komsomol The Communist Union of Youth, usually known as Komsomol, was the youth division of the Communist Party of the Soviet Union (CPSU). 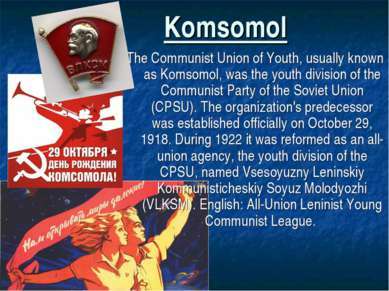 The organization's predecessor was established officially on October 29, 1918. During 1922 it was reformed as an all-union agency, the youth division of the CPSU, named Vsesoyuzny Leninskiy Kommunisticheskiy Soyuz Molodyozhi (VLKSM). 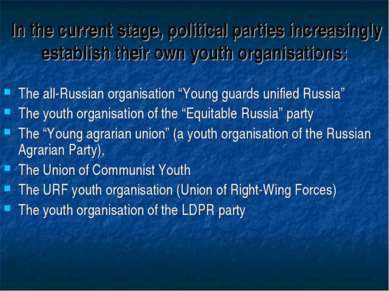 English: All-Union Leninist Young Communist League. 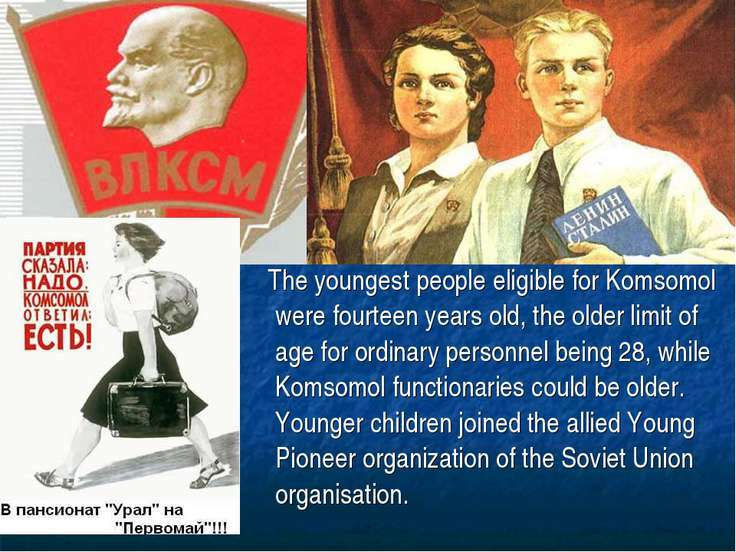 The youngest people eligible for Komsomol were fourteen years old, the older limit of age for ordinary personnel being 28, while Komsomol functionaries could be older. Younger children joined the allied Young Pioneer organization of the Soviet Union organisation. 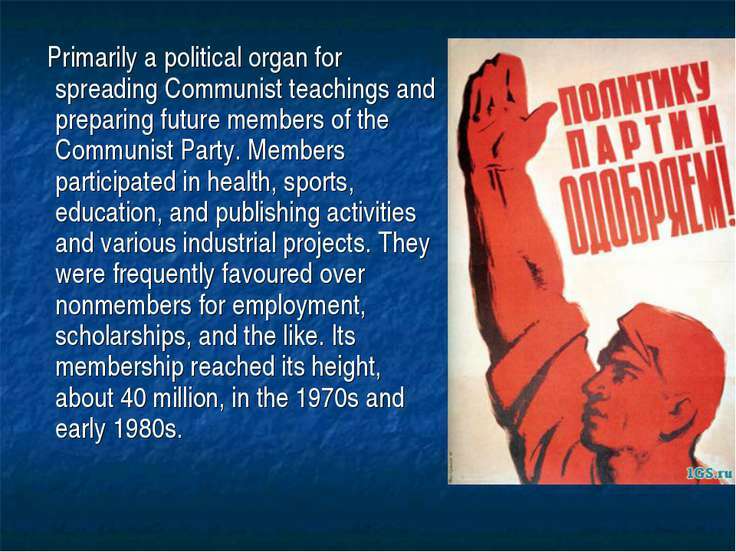 Primarily a political organ for spreading Communist teachings and preparing future members of the Communist Party. Members participated in health, sports, education, and publishing activities and various industrial projects. 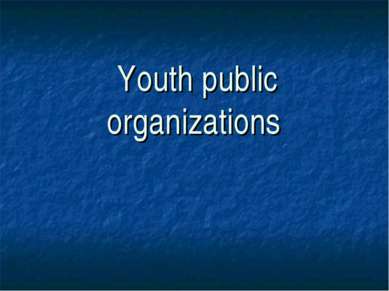 They were frequently favoured over nonmembers for employment, scholarships, and the like. 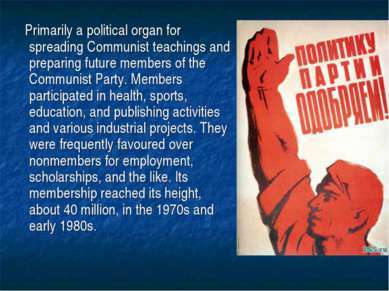 Its membership reached its height, about 40 million, in the 1970s and early 1980s. Little Octobrist It s a Soviet term that first appeared in 1923-1924, and at that time referred to children born in 1917, the year of the October revolution. Later, the term was used as the name of a youth organization for children between 7 and 9 years of age. 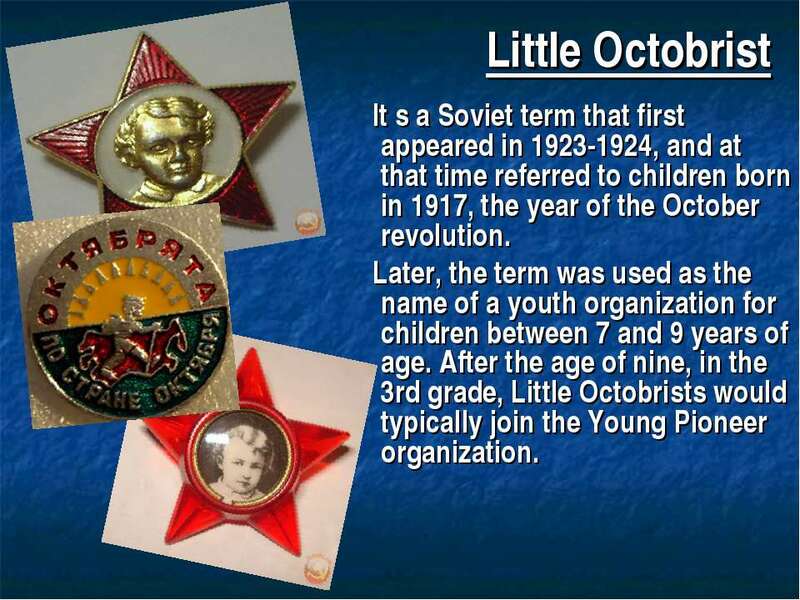 After the age of nine, in the 3rd grade, Little Octobrists would typically join the Young Pioneer organization. Little Octobrists were organized in groups each representing one school grade level. 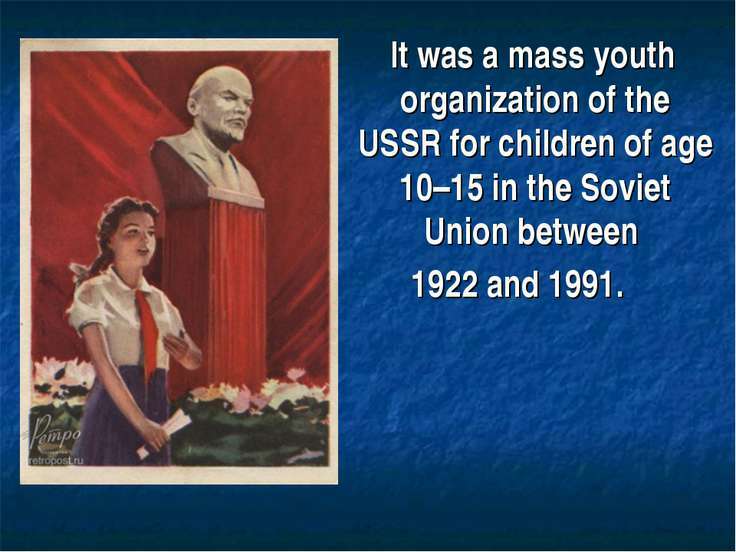 The group was divided into subgroups called little stars of 5 children each. Each group of Little Octobrists was under the leadership of one Young Pioneer from the Young Pioneer detachment. 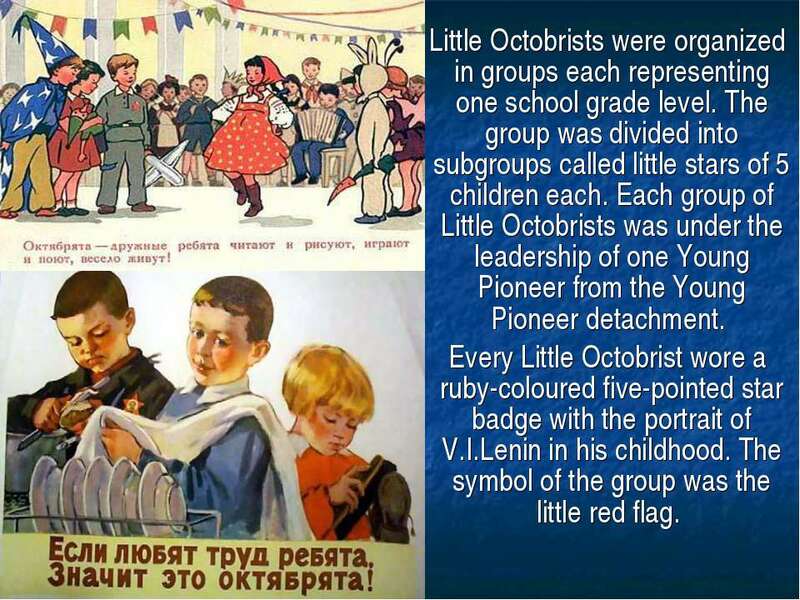 Every Little Octobrist wore a ruby-coloured five-pointed star badge with the portrait of V.I.Lenin in his childhood. The symbol of the group was the little red flag. 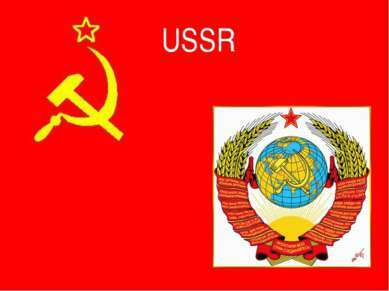 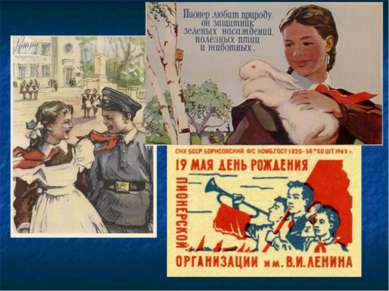 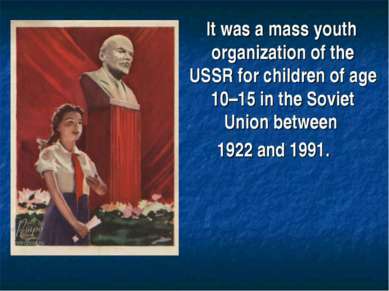 It was a mass youth organization of the USSR for children of age 10–15 in the Soviet Union between 1922 and 1991. 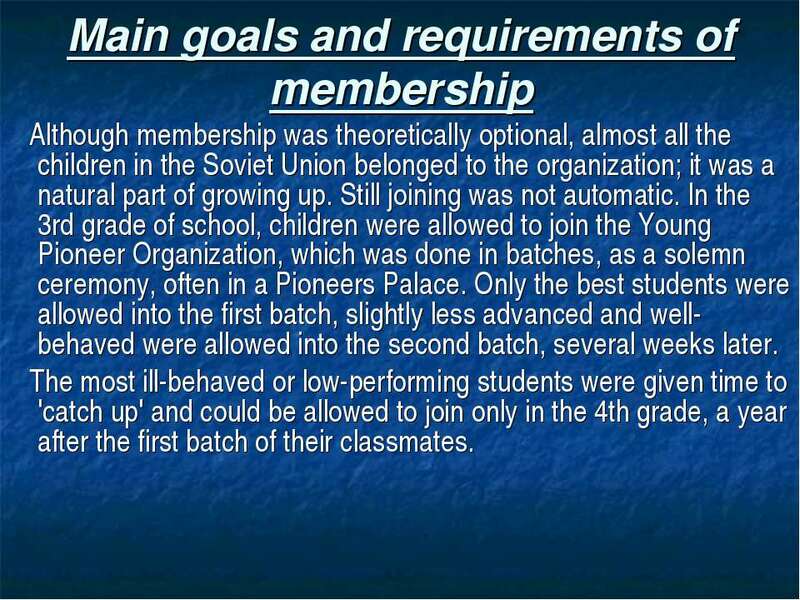 Main goals and requirements of membership Although membership was theoretically optional, almost all the children in the Soviet Union belonged to the organization; it was a natural part of growing up. Still joining was not automatic. 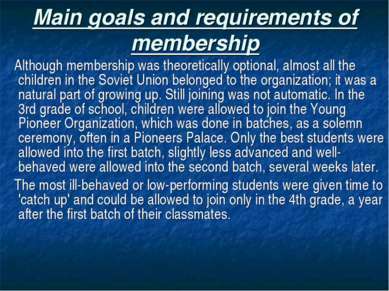 In the 3rd grade of school, children were allowed to join the Young Pioneer Organization, which was done in batches, as a solemn ceremony, often in a Pioneers Palace. Only the best students were allowed into the first batch, slightly less advanced and well-behaved were allowed into the second batch, several weeks later. 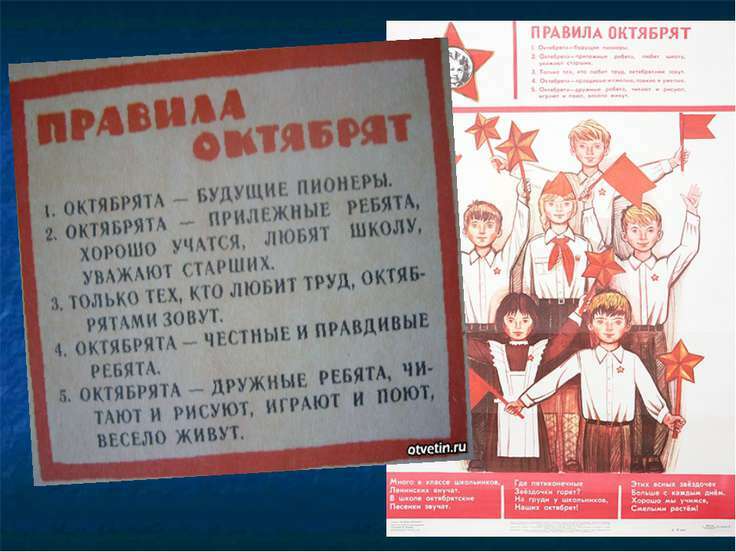 The most ill-behaved or low-performing students were given time to 'catch up' and could be allowed to join only in the 4th grade, a year after the first batch of their classmates. 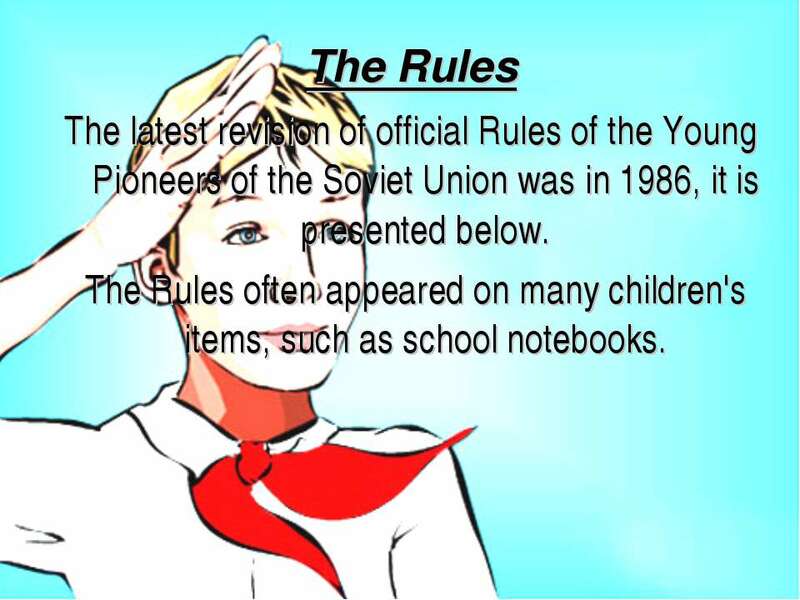 The Rules The latest revision of official Rules of the Young Pioneers of the Soviet Union was in 1986, it is presented below. 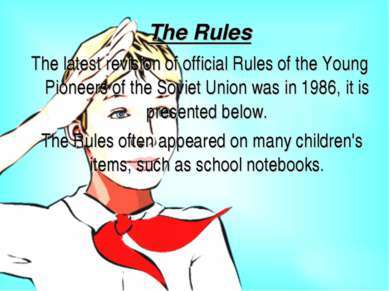 The Rules often appeared on many children's items, such as school notebooks. Pioneer is a young builder of communism, labours for the welfare of the Motherland, prepares to become its defender. 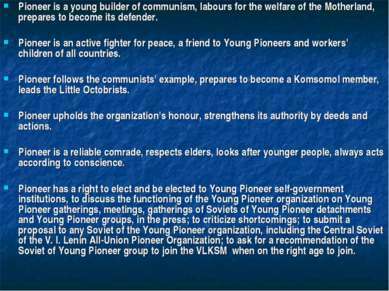 Pioneer is an active fighter for peace, a friend to Young Pioneers and workers' children of all countries. Pioneer follows the communists' example, prepares to become a Komsomol member, leads the Little Octobrists. 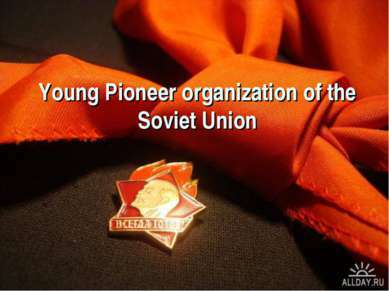 Pioneer upholds the organization's honour, strengthens its authority by deeds and actions. Pioneer is a reliable comrade, respects elders, looks after younger people, always acts according to conscience. Pioneer has a right to elect and be elected to Young Pioneer self-government institutions, to discuss the functioning of the Young Pioneer organization on Young Pioneer gatherings, meetings, gatherings of Soviets of Young Pioneer detachments and Young Pioneer groups, in the press; to criticize shortcomings; to submit a proposal to any Soviet of the Young Pioneer organization, including the Central Soviet of the V. I. Lenin All-Union Pioneer Organization; to ask for a recommendation of the Soviet of Young Pioneer group to join the VLKSM when on the right age to join. Пионер — юный строитель коммунизма — трудится и учится для блага Родины, готовится стать ее защитником. 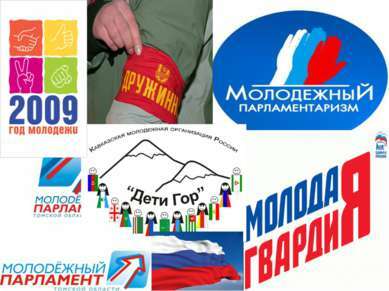 Пионер — активный борец за мир, друг пионерам и детям трудящихся всех стран. 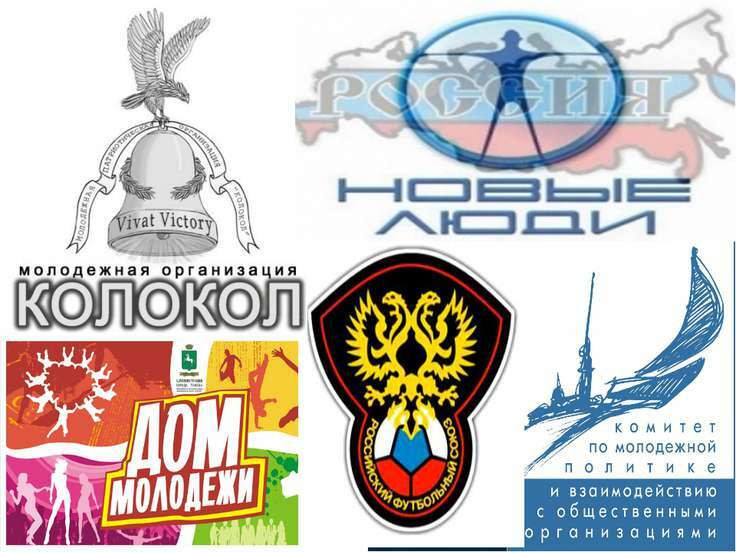 Пионер равняется на коммунистов, готовится стать комсомольцем, ведет за собой октябрят. Пионер дорожит честью своей организации, своими делами и поступками укрепляет ее авторитет. Пионер — надежный товарищ, уважает старших, заботится о младших, всегда поступает по совести. Пионер имеет право: избирать и быть избранным в органы пионерского самоуправления; обсуждать на пионерских сборах, слетах, сборах советов отрядов и дружин, в печати работу пионерской организации, критиковать недостатки, вносить предложения в любой совет пионерской организации, вплоть до Центрального Совета ВПО имени В. И. Ленина; просить рекомендацию совета дружины для вступления в ряды ВЛКСМ. Symbols, attributes, rituals and traditions Member pin. 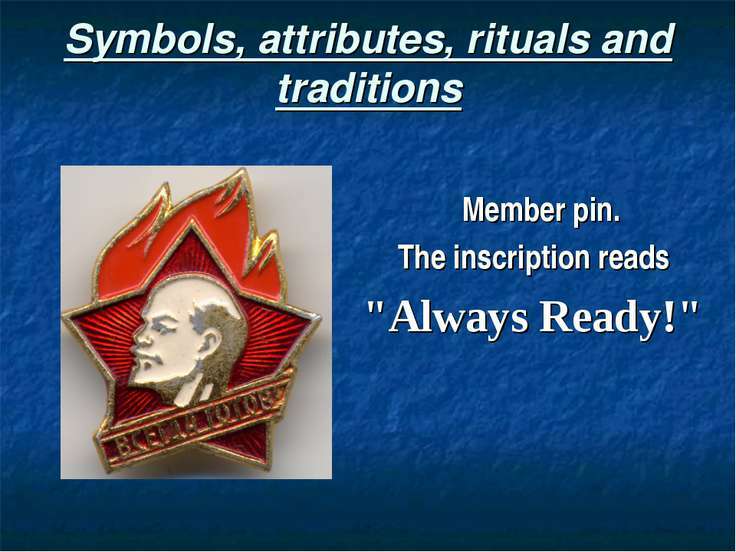 The inscription reads "Always Ready!" The main symbols of Young Pioneers were the red banner, flag, Young Pioneer's red tie, the badge. 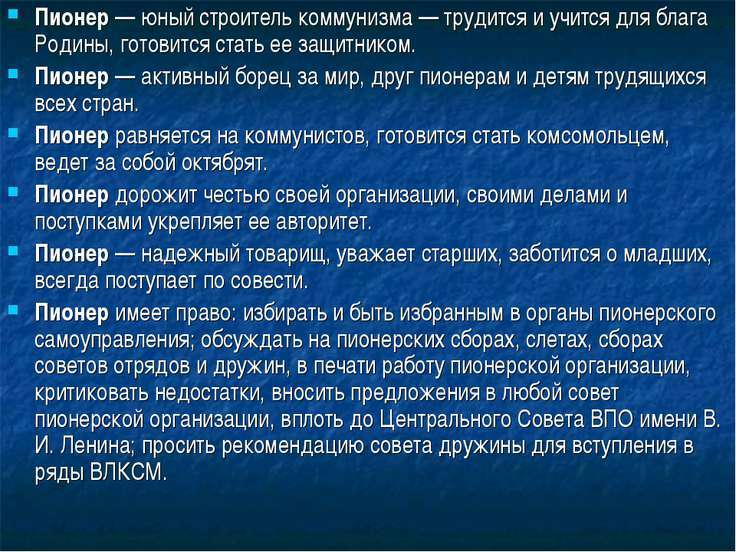 Attributes: the bugle, the drum, the uniform (with badges of rank). 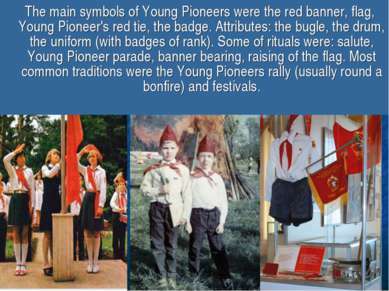 Some of rituals were: salute, Young Pioneer parade, banner bearing, raising of the flag. Most common traditions were the Young Pioneers rally (usually round a bonfire) and festivals. Awards The Young Pioneers who excelled in academic study, work, sports or social activity were elected to the self-governing institutions, were sent as delegates to the Young Pioneers gatherings (including All-Union ones). 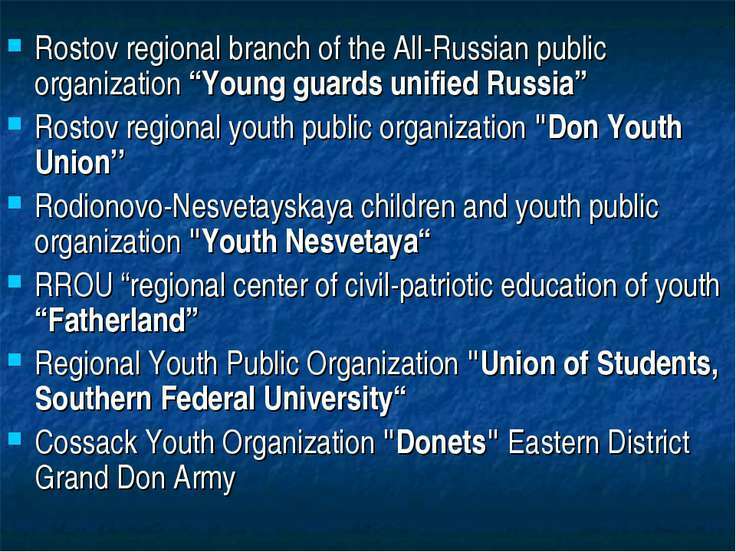 The most notable were recognized in the organization's Book of Honor. 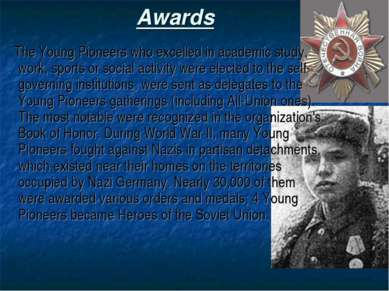 During World War II, many Young Pioneers fought against Nazis in partisan detachments, which existed near their homes on the territories occupied by Nazi Germany. Nearly 30,000 of them were awarded various orders and medals; 4 Young Pioneers became Heroes of the Soviet Union. 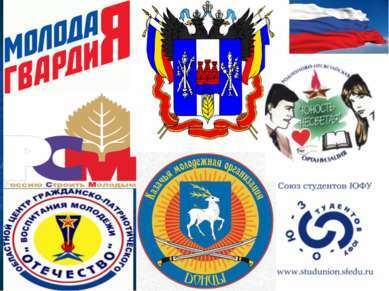 As of 1 January 2009, the Federal Register of Civic Children and Youth Organisations receiving state support, which is kept pursuant to the act “On state support of civic children and youth organisations” included 31 organisations, of which eight were children's organisation and 23 were youth organisations, 29 were all-Russian organisations and two were international organisations. 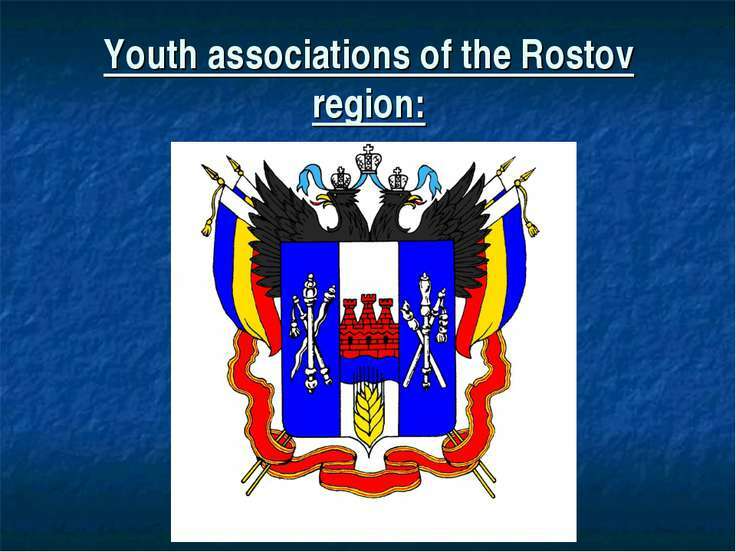 Russian organisation “Union youth housing complex of Russia” (Union JHV of Russia), The all-Russian organisation “Youth union of jurists in the Russian Federation” The all-Russian organisation “National youth league”. 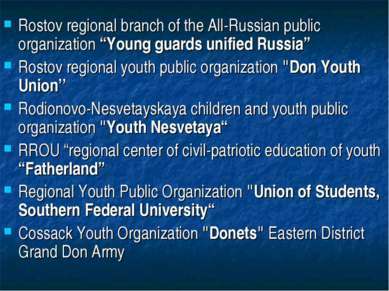 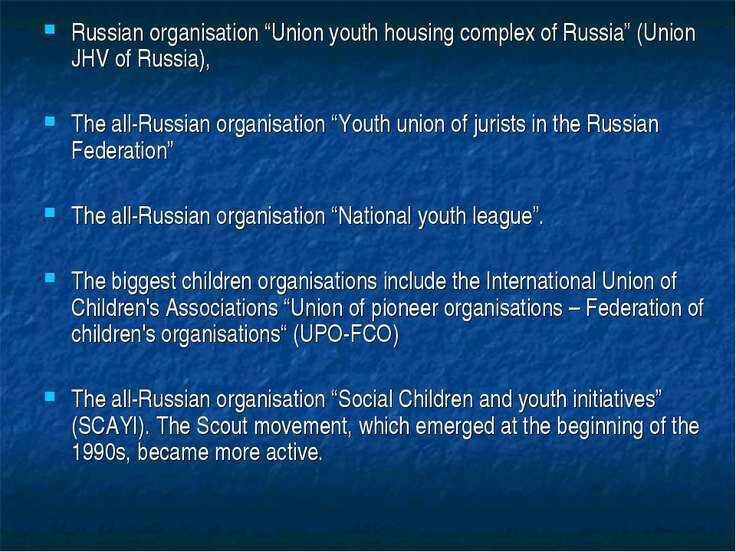 The biggest children organisations include the International Union of Children's Associations “Union of pioneer organisations – Federation of children's organisations“ (UPO-FCO) The all-Russian organisation “Social Children and youth initiatives” (SCAYI). 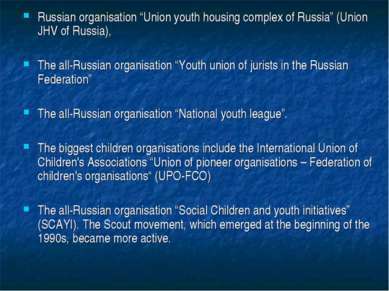 The Scout movement, which emerged at the beginning of the 1990s, became more active. 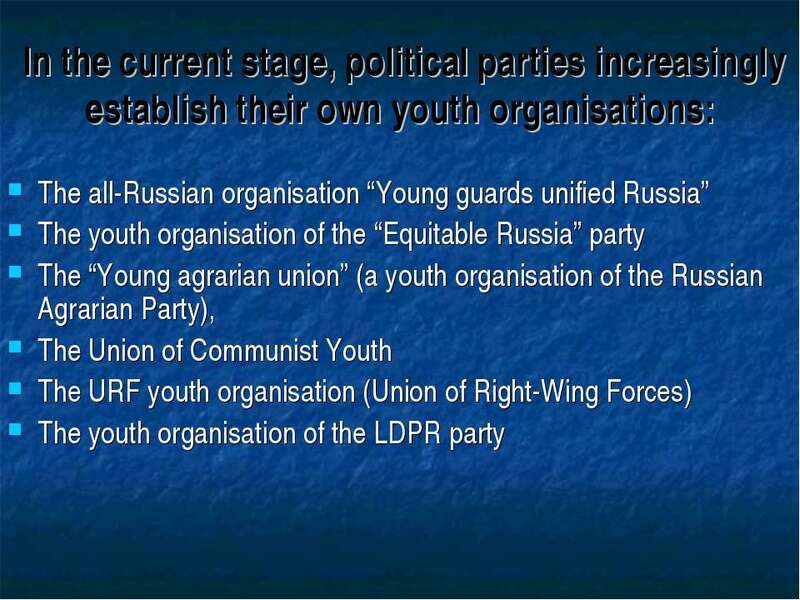 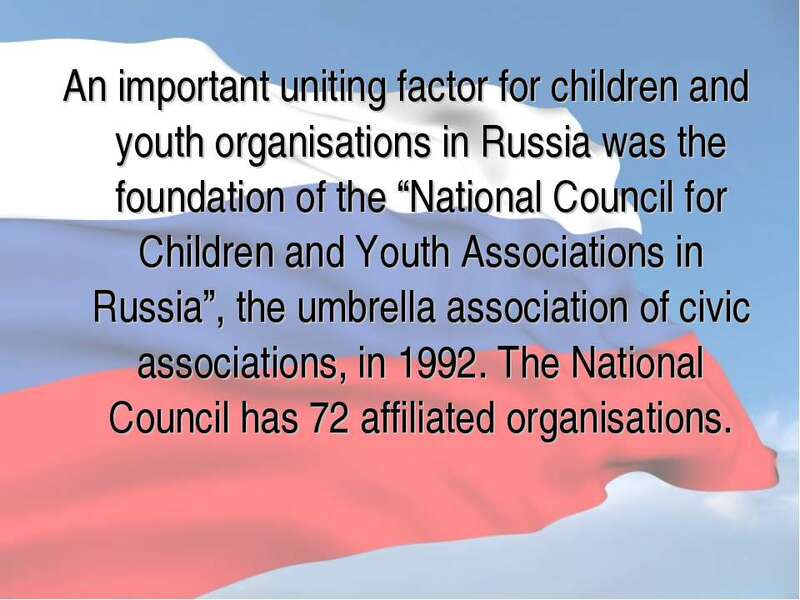 An important uniting factor for children and youth organisations in Russia was the foundation of the “National Council for Children and Youth Associations in Russia”, the umbrella association of civic associations, in 1992. 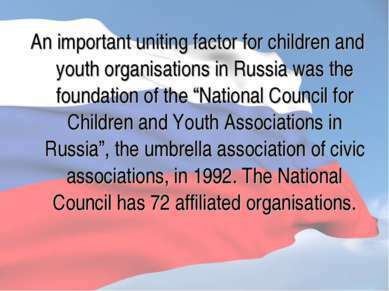 The National Council has 72 affiliated organisations.